I watched Velvet Buzzsaw and really enjoyed it. Everyone plays their character at just the right side of parody without ever becoming a blatant caricature, and the premise is just silly enough to be entertaining. I definitely enjoyed the character interactions the most, and would have enjoyed it as a flamboyant American Psychoesque movie if the supernatural elements had been removed. Call it a "hot take", but I find something soulless about these Disney live action remakes. With the exception of Will Smith Genie it's got this sheen of an overcautious replica about it. I’ll be there just for the music really. I’m sure the film will be great too, all these Disney live action remakes have got great reviews and word of mouth. I think I would like to just see more risks taken with stuff like this. Like when Capcom did RE2, kept the old formula but completely changed everything else about how the game works. Closest I can see to something daring in that trailer is Will Smith doing a Will Smith Genie and not trying to channel Robin Williams. But when it's so carefully trying to rethread the path taken by the original (and getting bits sort of weirdly wrong like not-menacing Jafar) it feels redundant. Just a copy. Well it's not for me I suppose. Erm, what? 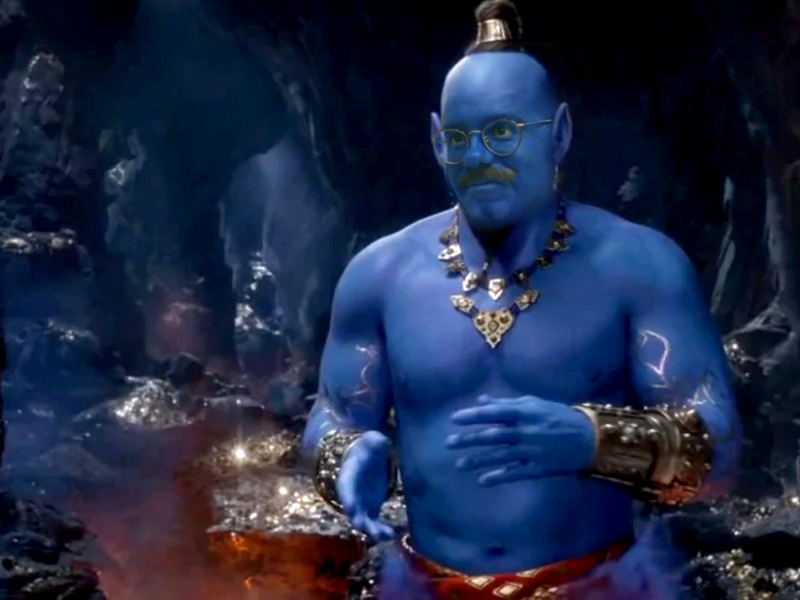 The genie looks terrible. It's good they haven't tried to recreate the Robin Williams performance, and that's the only good thing I can say. It reminded me of when they copy pasted the rocks head on to that Scorpion at the end of The Mummy 2. It reminded me of when they copy pasted the rocks head on to that Scorpion at the end of The Mummy 2. Disney’s record with these remakes speaks for themselves. They’re pretty much as sure a thing as you can get. That is as fanciful now as it was the last time you brought it up, Blakey 🙄. As @one-armed dwarf said, these Live Action remakes are just soulless. I'm a realist, I don't waste my time trying to find the positive in everything. I'd reserve judgement till we see more of it, or it comes out, but that teaser looks terrible. There are dozens of genies! Dozens! Not true at all @OCH. I’m a realist too and don’t try to find the positives in everything. I just - in general - seem to be a little less cynical than others, I’m not sure why that is but that’s me. I call things as I see them, if the film comes out and it’s shite they’ll get both barrels I assure you. @Blakey you are on a massive Disney bender at the moment with KH3 though, so maybe that is influencing it? It's cool you're excited about it, but you're literally the first person I've seen that genuinely seems to be. I'm more looking forward to the live action lion king with John Oliver myself. Wait a minute, Aladdin is directed by Guy Ritchie! I hope Vinnie and Brick Top are in it, I'm back on board. @DANGERMAN yeah he's the bird that was Rowen Atkinson in the original. I've never met anyone that watched the Love Guru before.